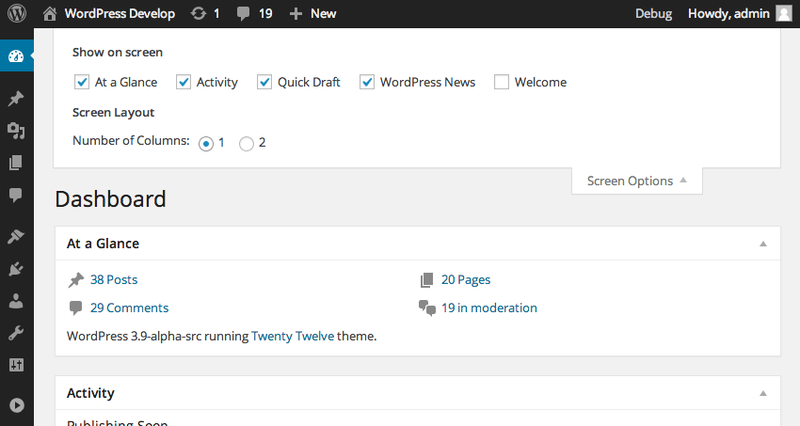 With the new Wordpress 3.8 under Screen Options they seem to have misplaced the "Columns" feature where you could put your widgets into 1 Column, 2 Columns, 3 Columns, or 4 Columns. My question is how to I force my Dashboard Widgets to only be 1 column, or in other words, take up the whole width of the screen versus just a portion of the screen? Another solution is to add the columns setting back to the settings. Anyway, you can change it by setting a custom width for .postbox-container. Use 50% for two columns and 100 % for just one column. Not the answer you're looking for? Browse other questions tagged widgets dashboard screen-options screen-layout or ask your own question. How do you force the wordpress dashboard to be 1 coulmn by default? Custom Fields on User Dashboard?